But weren't hippies all about peace? Remember how Byron was trying to seek out a peaceful solution for his people. True. And hippies were about non-violence, which Byron also preached. He was NOT "full of hate." He was rightfully full of fear, suspicion, and distrust, of those who exerted totalitarian control over the teeps, i.e. Psycorps, and those who used them for their own ends, like the Vorlons, and the normals. I certainly couldn't blame him if he did hate them, as he had more than ample reason, but he didn't. Did I say that I gave it a B? It looks like though past polls retain the votes of the past, they don't retain the association of who made those votes, enabling people to vote in a poll that they've already voted in before the switchover. OK, I admit, I don't mind seeing the end of the telepath arc, but I was impressed with the quality of this episode. Bester hit the nail on the head when he said that the central problem with telepaths was how to control them. He fails, Byron fails, and Earth Gov and the Alliance fail too. Bester usually operates with cool logic, but he sure messes things up here. There would have been a lot less dead if he hadn't stepped in in an untimely manner several times. What is it with Byron that makes it a personal issue for him? "Don't talk to strangers" is the kind of warning a father gives to his child. It occurs to me that this episode has a second leader couple: Lyta and Byron, Sheridan and Delenn being the primary one. At the end, she appears to be the "widow" character, taking over the business after his death. The teeps have their lowest moment here - having become terrorists and taking hostages - as well as their finest - Byron's resolve to sacrifice himself to save the lives of the hostages, even though they are mundanes. Bester lives out what he says, "I don't believe in dialogue, only action." He also has a great scene where he explains the "Asimov" block to Garibaldi. Byron isn't willing to take full responsibility for his actions and says to the mundanes: "We are what you made us." That is never true - each individual decides whether or not he allows others to influence his mindset. The ending is suitably dramatic! What is it with Byron that makes it a personal issue for him? I think the scene was around this episode where we learn that Byron and Bester used to be partners in Psi Corps. Last edited by JoeD80; February 4th 11 at 22:19. This is indeed a good episode .. not because it gets rid of Byron ... I don't rejoice in his death, although I am pleased to see that telepath arc come to an end. Well, sort of an end (Remember Byron!). I think the conflict between human telepaths and human mundanes is really interesting, but this particular story arc just didn't work for me. Probably because I can't stand Byron and his cult. I shouldn't have to like every chararcter to like a story arc, but there it is. It's interesting to get more background on Bester and Byron... It's also interesting that this back story is news to Lyta. He must have hidden this information from her, which doesn't really fit with his "we share everything here" philosophy. Then again, you can see why he'd want to hide that. Most interesting, I think, is that what Byron took away from that experience is a desire to never use violence (and get away from Psi Corps, obviously), but I think that a more useful basis of his movement would have been to get away from the "they are just mundanes" distinction between telepaths and normals. He seems to run his group with that same idea still intact. I don't know if that, necessarily, is why he failed, but it can't have helped. 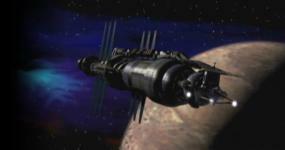 Babylon 5 security doesn't come off well in this storyline at all. I forgot to mention it in my comments on the previous episode, but it seems like it was VERY easy for the telepaths to take out all security guards in their path. Sure, they have the advantage of telepathy, and can easily get security codes out of the minds of guards, but aside from that, what we see on screen is the telepaths taking out the guards using physical violence. These are (as far as we know) a bunch of untrained civilians! That said, I do like the hostage scenes. And they brought back Peter! It seems like those "violent" telepaths are remarkably unanimous in their desire to give up and die at the end there, but I guess THAT is how much they don't want to go back to Psi Corps, which makes sense. I think the conflict between human telepaths and human mundanes is really interesting, but this particular story arc just didn't work for me. Probably because I can't stand Byron and his cult. I shouldn't have to like every chararcter to like a story arc, but there it is. Garibaldi & Bester: excellent scene. Bester: it's interesting to see that in spite of what one might be tempted to think (that Bester is the prototypical 'evil' tool of oppression), the truth might be more complex. Bester truly seems to believe, 100 %, in the system. He seems really upset because he doesn't understand Byron's gang's motives. He's truly baffled, sincerely so.